What personal qualities are required to acknowledge and confront the deep uncertainty and 'the inevitable fact of our ignorance' in a complex, fast-changing world? 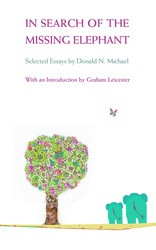 With this collection of five extraordinary and challenging essays, Graham Leicester introduces us to the astonishing intellect of Don Michael (1923 - 2000) whose wisdom, humanity, integrity, and commitment to confronting the most vexing and complex problems continue to inspire everyone who encounters his work. The touchstone of Don Michael's work is a commitment to individual, organisational and social learning. He writes in these essays with prophetic insight about the psychological temptations of denial in the face of such deep uncertainty, the consequential resistance to learning, and the resulting dangers of collapse, conflict and despair. The subject of the last essay, and the title of the book, concerns the Sufi story of blind people reaching a different conclusion about the 'elephant'. Don Michael proposes that, in the context of society today, the story-teller is blind and does not know what he is talking about, and that there is no elephant - because the human race, for the most part, is 'too complex, too interconnected, and too dynamic to comprehend... that there is no agreed-on interpretation that provides an enduring basis for coherent action based on an understanding of the enfolding context'. The introduction by Graham Leicester of the International Futures Forum (IFF) is a beautifully written guide to the development of Don Michael's thinking from the early 1950's through to his later work and, in particular, the five essays in this book - on leadership, governance, education, forecasting and planning, and technology and the difficulties that arise in the turbulent cultural context of the present day. In Search of the Missing Elephant is the IFF's 4th publication with Triarchy Press and is one of their sources of 'hope' in taking on the complex, messy, seemingly intractable issues - notably in the arenas of health, learning, governance and enterprise - where paradox, ambiguity and complexity characterise the landscape, where rapid change means yesterday's solution no longer works, where only genuine innovation has any chance of success. This is a thoughtful and provocative book for scenario planners, futurists, political leaders, media commentators, and anyone interested in developing a society in which man may be allowed to reach his full capacities.